Butterscotch Pie is the most decadent dessert you’ll have on your holiday table. 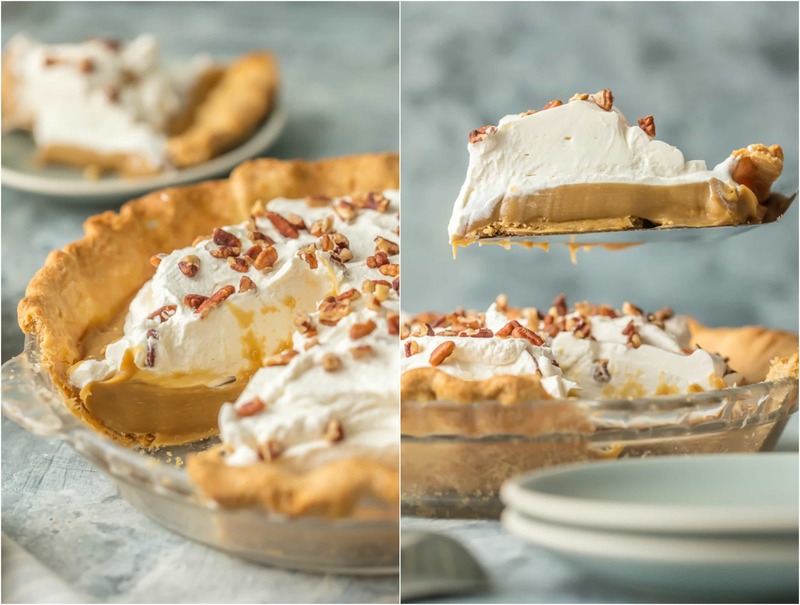 This Butterscotch Pie Recipe is so rich and amazing everyone will be asking for the recipe. It’s just like your Grandma’s Butterscotch Pie from years ago. This classic pie is perfect for easy holiday baking, especially perfect for Thanksgiving, Christmas, and Easter! 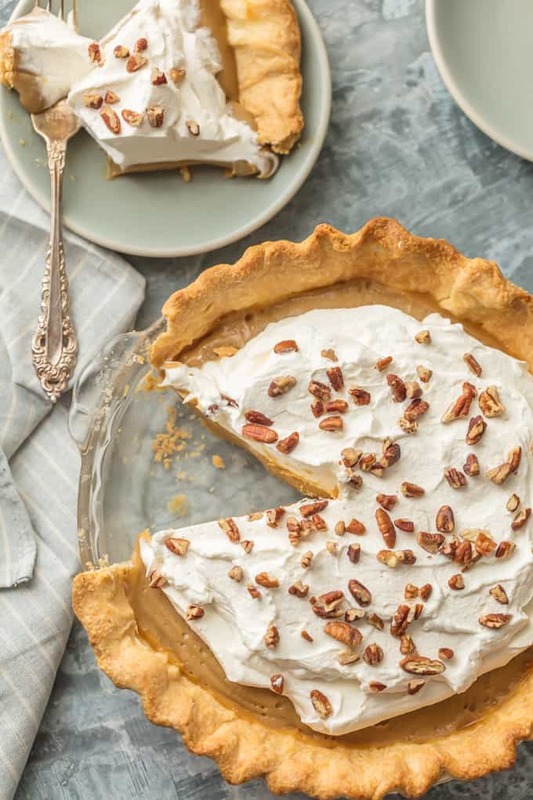 This Butterscotch Pie Recipe will instantly transport you to family times from years past. Growing up, my Grandma always had butterscotch candies on hand for every visit. I knew where to find them, and I loved them. As an adult, I haven’t tasted one in years, but I still know it’s one of my very favorite flavors. 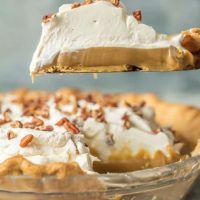 Transforming a delicious and comforting butterscotch candy into a Classic Butterscotch Pie seems like the right thing to do, and the result is a delicious, creamy, rich, FABULOUS pie just begging to be on your Thanksgiving, Christmas, or Easter table. 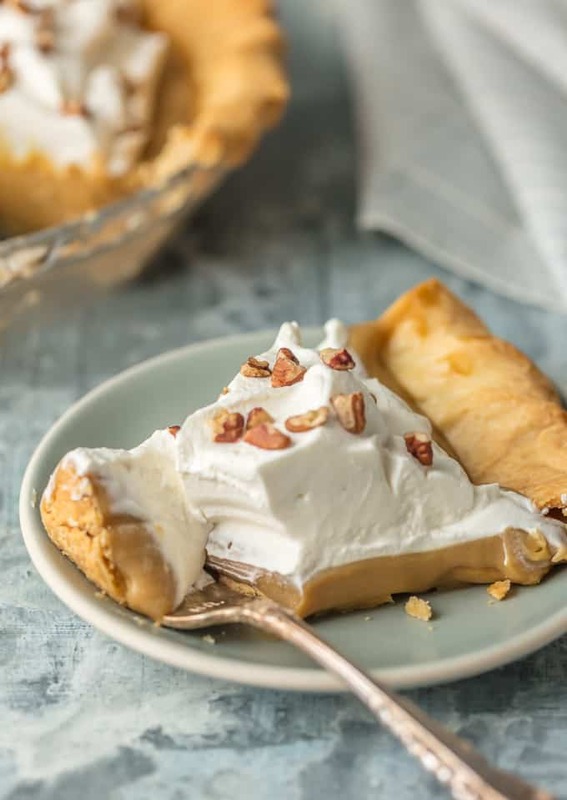 This Butterscotch Pie is simple to make, loaded with fresh whipped cream, and features a store bought crust. What’s not to love?! Just Taste This Classic Butterscotch Pie and it will instantly become a favorite decadent pie recipe. If tasting this pie doesn’t immediately make you feel at home, I’d be shocked. A little goes a long way, because it is RICH, but that’s how I like it. It’s the perfect sweet treat to end any family meal, especially around the holidays. We topped ours with toasted pecans and it added just the right amount of crunch and balanced the sweetness of the butterscotch. Just looking at these pictures has me needing to make another pie! How long does Butterscotch Pie last? This pie should be great for 3-5 days in the fridge when properly stored. I know it won’t last that long because you’ll eat it all IMMEDIATELY. How thick should Butterscotch Pie be? You want the filling of this Butterscotch Pie Recipe to be pretty firm, like a thick custard pudding. It should hold its form when cut. Butterscotch tastes a lot like toffee. That’s because toffee is actually butterscotch, just cooked longer. It also tastes like caramel. The main difference between caramel and butterscotch is that butterscotch has a brown sugar base and caramel has a white sugar base. Learn something new every day! I love that this Butterscotch Pie Recipe is so rich, because I can be satisfied with a small piece. Just the right amount of sweetness. I know everything Thanksgiving needs a pumpkin pie, but I’d argue this Classic Butterscotch Pie is the ultimate companion. I’ll take a slice of both please! SO DARN GOOD. It’s not just for holidays, although it’s a great pie for celebrating. It’s also an amazing pie to take to bake sales, Summer BBQ’s, or a regular Tuesday night if you end up loving it as much as we do. As I’m learning to cook, baking is still something I struggle with. Every time I learn a new amazing dessert recipe, I feel that much more confident. This Classic Butterscotch Pie has me patting myself on the back left and right. It’s just so darn good and…classic. Butterscotch Pie for the ultimate sweet treat win! See below for full details on how to make this Classic Butterscotch Pie Recipe. Enjoy! Butterscotch Pie is the most decadent dessert you'll have on your holiday table. 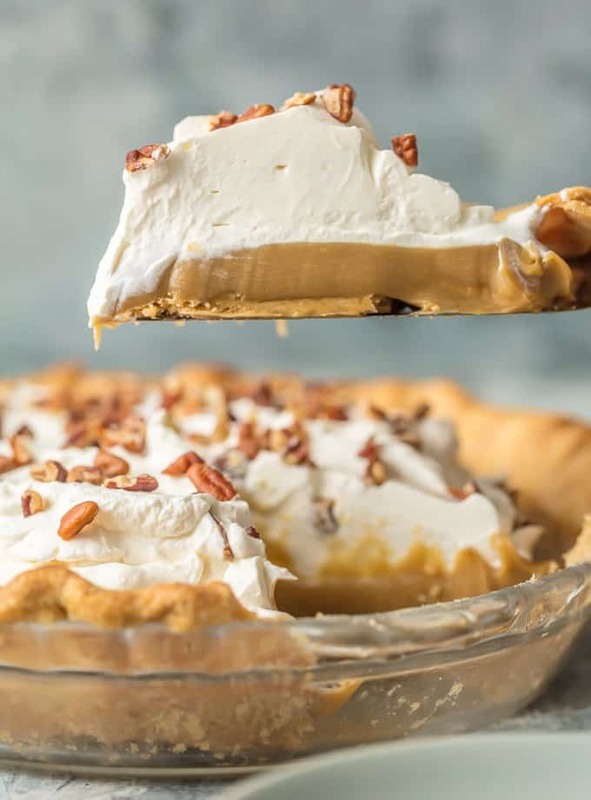 This Butterscotch Pie Recipe is so rich and amazing everyone will be asking for the recipe. It's just like your Grandma's Butterscotch Pie from years ago. This classic pie is perfect for easy holiday baking, especially perfect for Thanksgiving, Christmas, and Easter! In a medium saucepan, combine ½ cup brown sugar and ¼ cup butter. Cook over low heat until butter melts and mixture is smooth. Stir continuously. Remove from heat. Combine the remaining ¾ cup brown sugar, flour and cornstarch in a small bowl and mix well. Add the flour mixture to the butter mixture – stir until incorporated. Whisk while adding 2 cups whipping cream. Return saucepan to medium heat and stir or whisk until thickened and bubbly. Reduce heat to low, and cook 2 minutes more while stirring. Remove mixture from heat. In a small bowl, lightly beat the egg yolks. Very slowly, and while quickly whisking, incorporate 1 cup of the hot filling into the egg yolks. Add the yolk mixture to the brown sugar/butter mixture in the saucepan. Turn heat to medium, stir constantly and bring the mixture to a gentle boil. Once the mixture comes to a boil, reduce heat to low and cook for 2 more minutes. Remove from heat and stir in 3 tablespoons butter and 1 teaspoon vanilla. Cool to touch then pour the butterscotch filling into the baked, cooled pie shell. Cover the pie with plastic wrap. 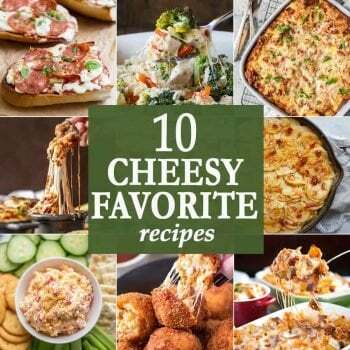 Refrigerate at least 2 hours or overnight before serving. In a large mixing bowl, beat 2 cups whipping cream, 2 tablespoons powdered sugar and ½ teaspoon vanilla extract, with an electric mixer, until soft peaks form. 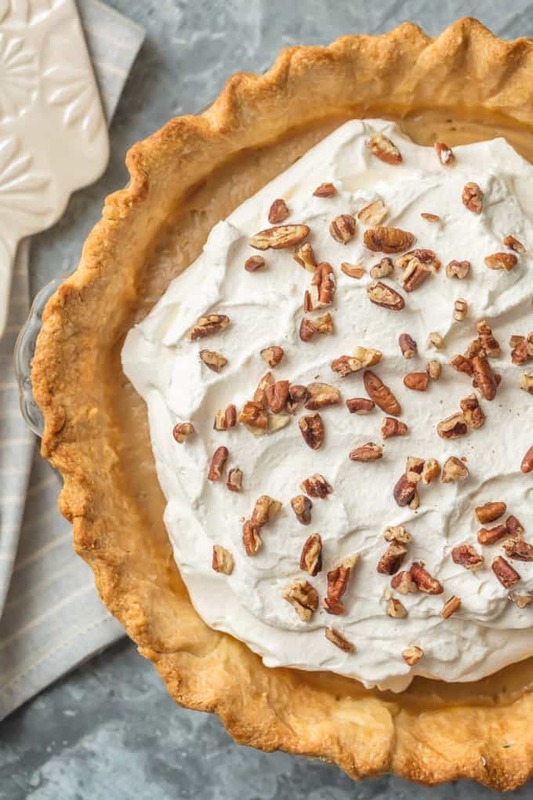 Remove plastic wrap from pie and top with the whipped cream topping. 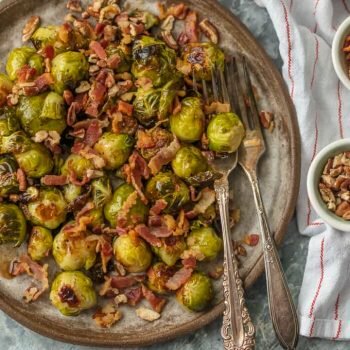 Sprinkle pecans on top. Serve immediately. wITH the meringue on top of the pie can’t you bake it in the oven? Hey Abigail, we just used whipped cream on top when serving. Some people do meringue but we preferred just whipped cream. Hope that helps! I just finished making the filling – the consistency seemed perfect when I removed it from heat after boiling. Once I added the butter and vanilla, the consistency changed to a lumpy oily mixture. Is that supposed to happen? Ugh I hope this didn’t ruin your Thanksgiving! Hope its a happy holiday regardless. So sorry I can’t be of more help.